Celebrated by audiences at home and abroad, indigenous artist Geoffrey Gurrumul Yunupingu was one of the most important and acclaimed voices to ever come out of Australia. GURRUMUL is a name most people have never heard of. So the image of him as seen on the cover of “Rolling Stone” magazine must stand for something. Celebrated by audiences at home and abroad, Indigenous artist Geoffrey Gurrumul Yunupingu was one of the most important and acclaimed voices to ever come out of Australia. Blind from birth, he found purpose and meaning through songs and music inspired by his community and country on Elcho Island in far North East Arnhem Land. Living a traditional Yolngu life, his breakthrough album ‘Gurrumul’ brought him to a crossroads as audiences and artists around the world began to embrace his music. William’s film follows his life as told by his mother, father, uncle and assortment of relatives. He has two white folk aid him in publicity and his work. GURRUMUL is unlike most biographies where there is downturn and then redemption. But Gurrumul is no angel either, as his manager gets extremely frustrated when he does not show up for his American tour. 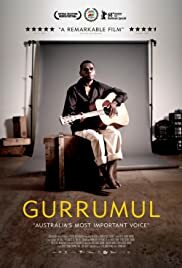 But the film that stresses Gurrumul’s voice and songs comes across as a rather lacklustre affair despite director William’s effort of educating the audience on Gurrumul’s tribal responsibilities. The only time the film comes alive is the duet performance of “Every Breathe you Take,” by Gurrumul and Sting.